Extracts from Adam's Diary is featured in The Unreliable Narrator. Be sure to read its companion piece, Eve's Diary. MONDAY.--This new creature with the long hair is a good deal in the way. It is always hanging around and following me about. I don't like this; I am not used to company. I wish it would stay with the other animals. . . . Cloudy today, wind in the east; think we shall have rain. . . . WE? Where did I get that word --the new creature uses it. TUESDAY.--Been examining the great waterfall. It is the finest thing on the estate, I think. The new creature calls it Niagara Falls --why, I am sure I do not know. Says it LOOKS like Niagara Falls. That is not a reason, it is mere waywardness and imbecility. I get no chance to name anything myself. The new creature names everything that comes along, before I can get in a protest. And always that same pretext is offered--it LOOKS like the thing. There is a dodo, for instance. Says the moment one looks at it one sees at a glance that it "looks like a dodo." It will have to keep that name, no doubt. It wearies me to fret about it, and it does no good, anyway. Dodo! It looks no more like a dodo than I do. SATURDAY.--The new creature eats too much fruit. We are going to run short, most likely. "We" again--that is ITS word; mine, too, now, from hearing it so much. Good deal of fog this morning. I do not go out in the fog myself. This new creature does. It goes out in all weathers, and stumps right in with its muddy feet. And talks. It used to be so pleasant and quiet here. SUNDAY.--Pulled through. This day is getting to be more and more trying. It was selected and set apart last November as a day of rest. I had already six of them per week before. This morning found the new creature trying to clod apples out of that forbidden tree. MONDAY.--The new creature says its name is Eve. That is all right, I have no objections. Says it is to call it by, when I want it to come. I said it was superfluous, then. The word evidently raised me in its respect; and indeed it is a large, good word and will bear repetition. It says it is not an It, it is a She. This is probably doubtful; yet it is all one to me; what she is were nothing to me if she would but go by herself and not talk. She says this park would make a tidy summer resort if there was any custom for it. Summer resort--another invention of hers --just words, without any meaning. What is a summer resort? But it is best not to ask her, she has such a rage for explaining. FRIDAY.--She has taken to beseeching me to stop going over the Falls. What harm does it do? Says it makes her shudder. I wonder why; I have always done it--always liked the plunge, and coolness. I supposed it was what the Falls were for. They have no other use that I can see, and they must have been made for something. She says they were only made for scenery--like the rhinoceros and the mastodon. I went over the Falls in a barrel--not satisfactory to her. Went over in a tub--still not satisfactory. Swam the Whirlpool and the Rapids in a fig-leaf suit. It got much damaged. Hence, tedious complaints about my extravagance. I am too much hampered here. What I need is a change of scene. SATURDAY.--I escaped last Tuesday night, and traveled two days, and built me another shelter in a secluded place, and obliterated my tracks as well as I could, but she hunted me out by means of a beast which she has tamed and calls a wolf, and came making that pitiful noise again, and shedding that water out of the places she looks with. I was obliged to return with her, but will presently emigrate again when occasion offers. She engages herself in many foolish things; among others; to study out why the animals called lions and tigers live on grass and flowers, when, as she says, the sort of teeth they wear would indicate that they were intended to eat each other. This is foolish, because to do that would be to kill each other, and that would introduce what, as I understand, is called "death"; and death, as I have been told, has not yet entered the Park. Which is a pity, on some accounts. MONDAY.--I believe I see what the week is for: it is to give time to rest up from the weariness of Sunday. It seems a good idea. . . . She has been climbing that tree again. Clodded her out of it. She said nobody was looking. Seems to consider that a sufficient justification for chancing any dangerous thing. Told her that. The word justification moved her admiration--and envy, too, I thought. It is a good word. TUESDAY.--She told me she was made out of a rib taken from my body. This is at least doubtful, if not more than that. I have not missed any rib. . . . She is in much trouble about the buzzard; says grass does not agree with it; is afraid she can't raise it; thinks it was intended to live on decayed flesh. The buzzard must get along the best it can with what is provided. We cannot overturn the whole scheme to accommodate the buzzard. SATURDAY.--She fell in the pond yesterday when she was looking at herself in it, which she is always doing. She nearly strangled, and said it was most uncomfortable. This made her sorry for the creatures which live in there, which she calls fish, for she continues to fasten names on to things that don't need them and don't come when they are called by them, which is a matter of no consequence to her, she is such a numbskull, anyway; so she got a lot of them out and brought them in last night and put them in my bed to keep warm, but I have noticed them now and then all day and I don't see that they are any happier there then they were before, only quieter. When night comes I shall throw them outdoors. I will not sleep with them again, for I find them clammy and unpleasant to lie among when a person hasn't anything on. TUESDAY.--She has taken up with a snake now. The other animals are glad, for she was always experimenting with them and bothering them; and I am glad because the snake talks, and this enables me to get a rest. FRIDAY.--She says the snake advises her to try the fruit of the tree, and says the result will be a great and fine and noble education. I told her there would be another result, too--it would introduce death into the world. That was a mistake--it had been better to keep the remark to myself; it only gave her an idea--she could save the sick buzzard, and furnish fresh meat to the despondent lions and tigers. I advised her to keep away from the tree. She said she wouldn't. I foresee trouble. Will emigrate. WEDNESDAY.--I have had a variegated time. I escaped last night, and rode a horse all night as fast as he could go, hoping to get clear of the Park and hide in some other country before the trouble should begin; but it was not to be. About an hour after sun-up, as I was riding through a flowery plain where thousands of animals were grazing, slumbering, or playing with each other, according to their wont, all of a sudden they broke into a tempest of frightful noises, and in one moment the plain was a frantic commotion and every beast was destroying its neighbor. 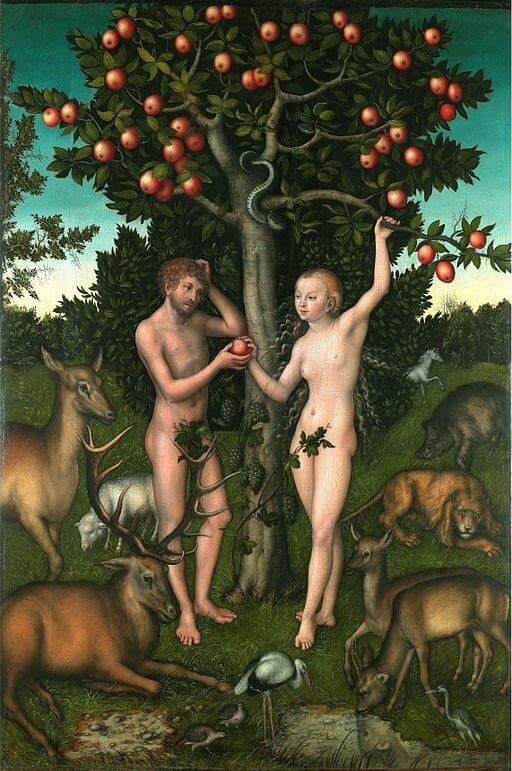 I knew what it meant --Eve had eaten that fruit, and death was come into the world. . . . The tigers ate my house, paying no attention when I ordered them to desist, and they would have eaten me if I had stayed --which I didn't, but went away in much haste. . . . I found this place, outside the Park, and was fairly comfortable for a few days, but she has found me out. Found me out, and has named the place Tonawanda --says it LOOKS like that. In fact I was not sorry she came, for there are but meager pickings here, and she brought some of those apples. I was obliged to eat them, I was so hungry. It was against my principles, but I find that principles have no real force except when one is well fed. . . . She came curtained in boughs and bunches of leaves, and when I asked her what she meant by such nonsense, and snatched them away and threw them down, she tittered and blushed. I had never seen a person titter and blush before, and to me it seemed unbecoming and idiotic. She said I would soon know how it was myself. This was correct. Hungry as I was, I laid down the apple half-eaten--certainly the best one I ever saw, considering the lateness of the season --and arrayed myself in the discarded boughs and branches, and then spoke to her with some severity and ordered her to go and get some more and not make a spectacle or herself. She did it, and after this we crept down to where the wild-beast battle had been, and collected some skins, and I made her patch together a couple of suits proper for public occasions. They are uncomfortable, it is true, but stylish, and that is the main point about clothes. . . . I find she is a good deal of a companion. I see I should be lonesome and depressed without her, now that I have lost my property. Another thing, she says it is ordered that we work for our living hereafter. She will be useful. I will superintend. TEN DAYS LATER.--She accuses ME of being the cause of our disaster! She says, with apparent sincerity and truth, that the Serpent assured her that the forbidden fruit was not apples, it was chestnuts. I said I was innocent, then, for I had not eaten any chestnuts. She said the Serpent informed her that "chestnut" was a figurative term meaning an aged and moldy joke. I turned pale at that, for I have made many jokes to pass the weary time, and some of them could have been of that sort, though I had honestly supposed that they were new when I made them. She asked me if I had made one just at the time of the catastrophe. I was obliged to admit that I had made one to myself, though not aloud. It was this. I was thinking about the Falls, and I said to myself, "How wonderful it is to see that vast body of water tumble down there!" Then in an instant a bright thought flashed into my head, and I let it fly, saying, "It would be a deal more wonderful to see it tumble UP there!" --and I was just about to kill myself with laughing at it when all nature broke loose in war and death and I had to flee for my life. "There," she said, with triumph, "that is just it; the Serpent mentioned that very jest, and called it the First Chestnut, and said it was coeval with the creation." Alas, I am indeed to blame. Would that I were not witty; oh, that I had never had that radiant thought! NEXT YEAR.--We have named it Cain. She caught it while I was up country trapping on the North Shore of the Erie; caught it in the timber a couple of miles from our dug-out--or it might have been four, she isn't certain which. It resembles us in some ways, and may be a relation. That is what she thinks, but this is an error, in my judgment. The difference in size warrants the conclusion that it is a different and new kind of animal--a fish, perhaps, though when I put it in the water to see, it sank, and she plunged in and snatched it out before there was opportunity for the experiment to determine the matter. I still think it is a fish, but she is indifferent about what it is, and will not let me have it to try. I do not understand this. The coming of the creature seems to have changed her whole nature and made her unreasonable about experiments. She thinks more of it than she does of any of the other animals, but is not able to explain why. Her mind is disordered--everything shows it. Sometimes she carries the fish in her arms half the night when it complains and wants to get to the water. At such times the water comes out of the places in her face that she looks out of, and she pats the fish on the back and makes soft sounds with her mouth to soothe it, and betrays sorrow and solicitude in a hundred ways. I have never seen her do like this with any other fish, and it troubles me greatly. She used to carry the young tigers around so, and play with them, before we lost our property, but it was only play; she never took on about them like this when their dinner disagreed with them. SUNDAY.--She doesn't work, Sundays, but lies around all tired out, and likes to have the fish wallow over her; and she makes fool noises to amuse it, and pretends to chew its paws, and that makes it laugh. I have not seen a fish before that could laugh. This makes me doubt. . . . I have come to like Sunday myself. Superintending all the week tires a body so. There ought to be more Sundays. In the old days they were tough, but now they come handy. WEDNESDAY.--It isn't a fish. I cannot quite make out what it is. It makes curious devilish noises when not satisfied, and says "goo-goo" when it is. It is not one of us, for it doesn't walk; it is not a bird, for it doesn't fly; it is not a frog, for it doesn't hop; it is not a snake, for it doesn't crawl; I feel sure it is not a fish, though I cannot get a chance to find out whether it can swim or not. It merely lies around, and mostly on its back, with its feet up. I have not seen any other animal do that before. I said I believed it was an enigma; but she only admired the word without understanding it. In my judgment it is either an enigma or some kind of a bug. If it dies, I will take it apart and see what its arrangements are. I never had a thing perplex me so. THREE MONTHS LATER.--The perplexity augments instead of diminishing. I sleep but little. It has ceased from lying around, and goes about on its four legs now. Yet it differs from the other four legged animals, in that its front legs are unusually short, consequently this causes the main part of its person to stick up uncomfortably high in the air, and this is not attractive. It is built much as we are, but its method of traveling shows that it is not of our breed. The short front legs and long hind ones indicate that it is a of the kangaroo family, but it is a marked variation of that species, since the true kangaroo hops, whereas this one never does. Still it is a curious and interesting variety, and has not been catalogued before. As I discovered it, I have felt justified in securing the credit of the discovery by attaching my name to it, and hence have called it Kangaroorum Adamiensis. . . . It must have been a young one when it came, for it has grown exceedingly since. It must be five times as big, now, as it was then, and when discontented it is able to make from twenty-two to thirty-eight times the noise it made at first. Coercion does not modify this, but has the contrary effect. For this reason I discontinued the system. She reconciles it by persuasion, and by giving it things which she had previously told me she wouldn't give it. As already observed, I was not at home when it first came, and she told me she found it in the woods. It seems odd that it should be the only one, yet it must be so, for I have worn myself out these many weeks trying to find another one to add to my collection, and for this to play with; for surely then it would be quieter and we could tame it more easily. But I find none, nor any vestige of any; and strangest of all, no tracks. It has to live on the ground, it cannot help itself; therefore, how does it get about without leaving a track? I have set a dozen traps, but they do no good. I catch all small animals except that one; animals that merely go into the trap out of curiosity, I think, to see what the milk is there for. They never drink it. THREE MONTHS LATER.--The Kangaroo still continues to grow, which is very strange and perplexing. I never knew one to be so long getting its growth. It has fur on its head now; not like kangaroo fur, but exactly like our hair except that it is much finer and softer, and instead of being black is red. I am like to lose my mind over the capricious and harassing developments of this unclassifiable zoological freak. If I could catch another one--but that is hopeless; it is a new variety, and the only sample; this is plain. But I caught a true kangaroo and brought it in, thinking that this one, being lonesome, would rather have that for company than have no kin at all, or any animal it could feel a nearness to or get sympathy from in its forlorn condition here among strangers who do not know its ways or habits, or what to do to make it feel that it is among friends; but it was a mistake--it went into such fits at the sight of the kangaroo that I was convinced it had never seen one before. I pity the poor noisy little animal, but there is nothing I can do to make it happy. If I could tame it--but that is out of the question; the more I try the worse I seem to make it. It grieves me to the heart to see it in its little storms of sorrow and passion. I wanted to let it go, but she wouldn't hear of it. That seemed cruel and not like her; and yet she may be right. It might be lonelier than ever; for since I cannot find another one, how could IT? FIVE MONTHS LATER.--It is not a kangaroo. No, for it supports itself by holding to her finger, and thus goes a few steps on its hind legs, and then falls down. It is probably some kind of a bear; and yet it has no tail--as yet--and no fur, except upon its head. It still keeps on growing--that is a curious circumstance, for bears get their growth earlier than this. Bears are dangerous --since our catastrophe--and I shall not be satisfied to have this one prowling about the place much longer without a muzzle on. I have offered to get her a kangaroo if she would let this one go, but it did no good--she is determined to run us into all sorts of foolish risks, I think. She was not like this before she lost her mind. A FORTNIGHT LATER.--I examined its mouth. There is no danger yet: it has only one tooth. It has no tail yet. It makes more noise now than it ever did before--and mainly at night. I have moved out. But I shall go over, mornings, to breakfast, and see if it has more teeth. If it gets a mouthful of teeth it will be time for it to go, tail or no tail, for a bear does not need a tail in order to be dangerous. FOUR MONTHS LATER.--I have been off hunting and fishing a month, up in the region that she calls Buffalo; I don't know why, unless it is because there are not any buffaloes there. Meantime the bear has learned to paddle around all by itself on its hind legs, and says "poppa" and "momma." It is certainly a new species. This resemblance to words may be purely accidental, of course, and may have no purpose or meaning; but even in that case it is still extraordinary, and is a thing which no other bear can do. This imitation of speech, taken together with general absence of fur and entire absence of tail, sufficiently indicates that this is a new kind of bear. The further study of it will be exceedingly interesting. Meantime I will go off on a far expedition among the forests of the north and make an exhaustive search. There must certainly be another one somewhere, and this one will be less dangerous when it has company of its own species. I will go straightway; but I will muzzle this one first. THREE MONTHS LATER.--It has been a weary, weary hunt, yet I have had no success. In the meantime, without stirring from the home estate, she has caught another one! I never saw such luck. I might have hunted these woods a hundred years, I never would have run across that thing. NEXT DAY.--I have been comparing the new one with the old one, and it is perfectly plain that they are of the same breed. I was going to stuff one of them for my collection, but she is prejudiced against it for some reason or other; so I have relinquished the idea, though I think it is a mistake. It would be an irreparable loss to science if they should get away. The old one is tamer than it was and can laugh and talk like a parrot, having learned this, no doubt, from being with the parrot so much, and having the imitative faculty in a high developed degree. I shall be astonished if it turns out to be a new kind of parrot; and yet I ought not to be astonished, for it has already been everything else it could think of since those first days when it was a fish. The new one is as ugly as the old one was at first; has the same sulphur-and-raw-meat complexion and the same singular head without any fur on it. She calls it Abel. TEN YEARS LATER.--They are BOYS; we found it out long ago. It was their coming in that small immature shape that puzzled us; we were not used to it. There are some girls now. Abel is a good boy, but if Cain had stayed a bear it would have improved him. After all these years, I see that I was mistaken about Eve in the beginning; it is better to live outside the Garden with her than inside it without her. At first I thought she talked too much; but now I should be sorry to have that voice fall silent and pass out of my life. Blessed be the chestnut that brought us near together and taught me to know the goodness of her heart and the sweetness of her spirit! This story is a companion piece to be read together with Eve's Diary. You might also enjoy reading A Monument to Adam. Add Extracts from Adam's Diary to your own personal library.